63% of Israelis would prefer that Peres's term be extended, according to Channel 2 poll. If not, MK Reuven Rivlin is the leading candidate. Most Israelis favor the possibility that President Shimon Peres will remain in his position for a second term, according to a Channel 2 News poll released Monday evening. 63% of respondents expressed support for Peres’s term, which is to end this summer, being extended by three years. 28% said they opposed extending Peres’s term in office. The poll comes following reports that Peres would seek another seven-year term as President. This would require a legislative change, as under the current law, the President is to serve a single seven year term. Some reports indicated that Prime Minister Binyamin Netanyahu would seek to pass legislation extending Peres’s term, fearing that Peres, after he concludes his term as President, will form a new political party that could beat Netanyahu in the next elections. 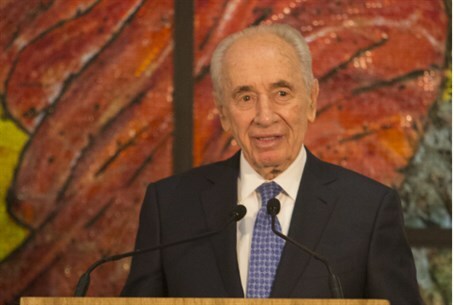 Peres declared last month that he will end his term as scheduled next summer. Monday’s poll also dealt with Peres’s successor as President, with respondents being asked who they would prefer to see as President should Peres’s term not be extended. Former Knesset Speaker MK Reuven Rivlin (Likud Beytenu), who ran against Peres in 2007 and has expressed his desire to run again, was placed first with 27% support. Rivlin was followed by MK Binyamin Ben-Eliezer (Labor) with 16%. Minister Silvan Shalom, another member Likud Beytenu whose name has been recently mentioned as a candidate but has declared that he is not considering it, received 13% support. Jewish Agency Chairman and former Knesset member Natan Sharansky was behind Shalom with 9% and former Knesset Speaker Dalia Itzik was at the bottom of the list with 5% support. Itzik served as acting president in 2007, when Moshe Katzav took a three month leave of absence before resigning altogether. The Knesset Speaker stands first in the line of succession in Israel. It should be noted that the President in Israel is elected by the members of the Knesset and not by the Israeli public.